My works are based on harmonic ratios or progressions like the Golden Mean. I use lines to mark the intervals between the numbers of the progression. These lines are then projected into a virtual space and wrapped around that virtual space infinitely. 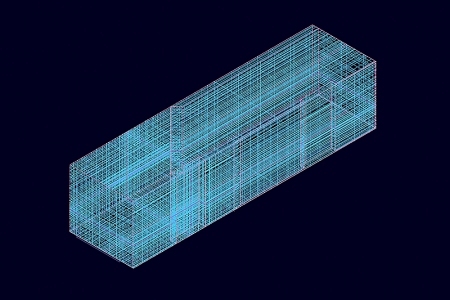 The resulting harmonic grid matrix reflects conditions in the given architectural space. The harmonic grid functions in these drawings as a ground, which, in addition to mapping an architectural space, also references an historical one. To create a virtual model of an architectural space, I measure and draw every detail in it. Using an architectural modeling program such as CAD to create a virtual space gives actual dimensions to all the intervals. The starting point is one inch, which corresponds to the distance between the joint and end of the thumb; it is the smallest module of the body. The grids used for the Treaty of 1868 diptychs come from a matrix created by wrapping a ground floor space in Beacon Hill on the Boston Commons. The building was built in the 19th century and was once the home of Supreme Court Justice Oliver Wendall Holmes. Holmes was responsible for the Supreme Court decision that voided all treaties with Native Americans by changing their status from sovereign nations to wards of the state. The historic decision is called Lone Wolf vs. Hitchcock and was handed down in 1905. The Treaty of 1868 canvases will articulate a relationship between two places and two moments in historical time through a series of events on canvas. By pairing the historical context with an architectural one, I am using the room as a framing device. The virtual wrapping of that room with harmonic progressions is both an act and a metaphor for mapping aspects of a specific space onto a surface. The resulting binding of time and space allows for a realization that the complexity of interrelationship is not immediate apparent, but rather unfolds. The Treaty of 1868 project grew out of my decade long journey into Lakota spiritual traditions, where I gained a new vision of our interrelatedness. My intention is to create a space to acknowledge the physical, legal and cultural violence of our shared past. In its effect, the proposed project aims to make the dominant culture aware of a history that has been largely suppressed.